“It’s a straight forward Western, Sergio Leone-like Western,” Russell said. “It’s an intricate story and in the beginning you don’t know why it’s taking so long” to get started. He was talking about the first hour and forty-five minutes of “The Hateful Eight,” most of which takes place in a stagecoach hurtling through a brutal snowy Wyoming landscape. Ruth is taking a woman in chains, Daisy Domergue, to Red Rock, through a blizzard, for $10,000 bounty and the hangman’s noose. 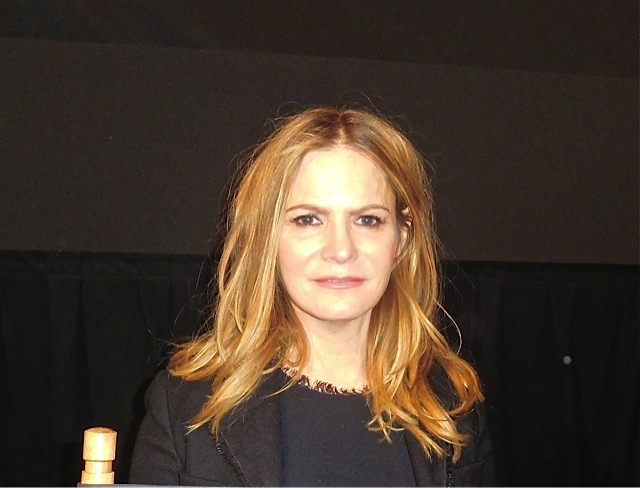 Daisy is played by Jennifer Jason Leigh, in a welcome comeback to big movies, who was also at the lunch. One of the first screenings of “The Hateful Eight” took place that evening at the Village East Cinema on East Second Street for BAFTA and Producer Guild of America members. The line, which snaked around the block, began forming hours before the screening. As Russell noted, the first hour and forty-five minutes of the more than three hour long film is about the journey to Red Rock with Daisy, who he hauls off and slugs every few minutes so her face is web of blood and bruises. Along the way Ruth encounters Major Marquis Warren (Samuel L. Jackson, in an Oscar level performance), a former Union officer and Chris Mannix (Walton Goggins) a Southerner who claims to be the new Sheriff of Red Rock, and they all journey together and journey together to Minnie’s Haberdashery, a stagecoach stopover. But instead of Minnie and her staff they face four unfamiliar, tough guys played by Demian Bichir, Tim Roth, Michael Madsen and Bruce Dern. Before the action gets going there’s a 12-minute intermission. Quentin Tarantino is an omniscient narrator at one point during the story. While the movie is a Western there are also shades of “Reservoir Dogs,” since the action takes place in one place and the violence is intense. Tarantino has surpassed himself in the number of times the “N” word is thrown around. This plot has basically already been done; it was called “Stagecoach”, and already had what later became a star-studded cast. If either Tarantino or your reviewers think it’s a brand-new concept — you’ve conveniently forgotten the original. Give credit where credit is due, and quit rehashing and promoting remakes when you can’t think of anything original to do yourselves. That this is simply longer and more violent doesn’t make it better — just longer and more violent. Big deal.